Happy Monday! Today is my day off, which means I can trade in my blowdryer for some power tools of a little bit. 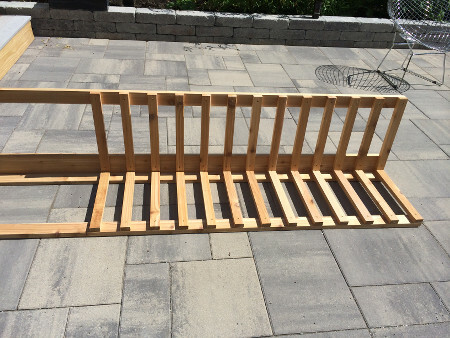 And today it’s time to build a Rose Trellis for the two Cloud 10 Climbing Roses in our back yard. 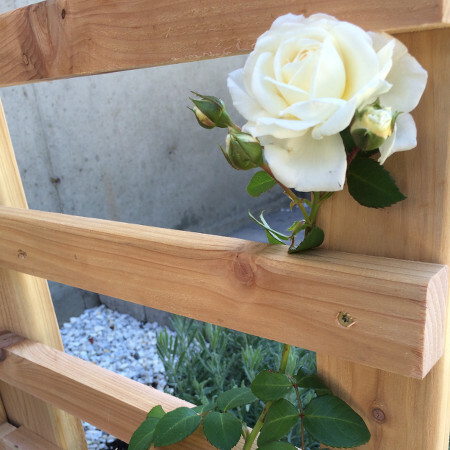 This is a happy rose on it’s new trellis! We have a huge amount of exposed foundation on our house, so these roses promise to take up some of that visual space. I planted them in Spring, but since I never got around to building a rose trellis they look pretty pathetic. In fact, one of my favorite friends in the whole world came over this weekend and she asked me why my rose bushes looked like someone stomped on them. She’s right- they did! So it is time to build. 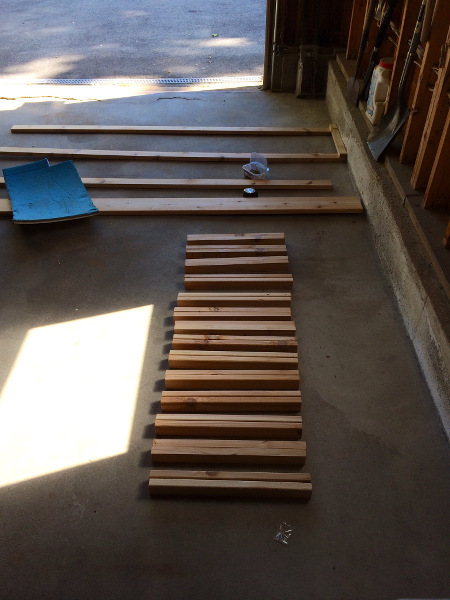 This was a good chance to use the leftover 1″X6″X10′ cedar planks from our front steps. Mr. Heatherland did all the cutting and I did the assembling. 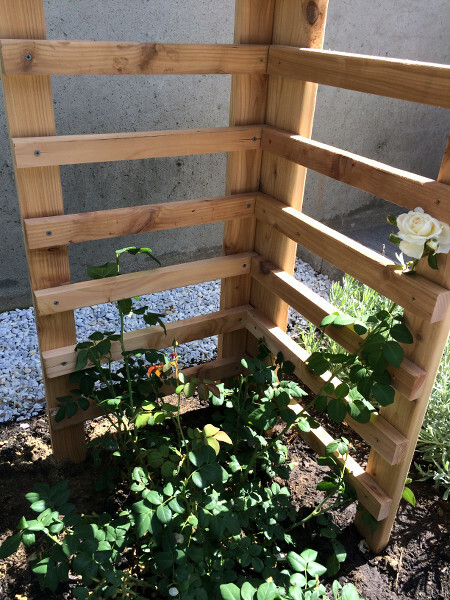 I didn’t wan’t it to look like a regular garden rose trellis, or a rose lattice. We built something simple and different. All the cuts for one trellis. 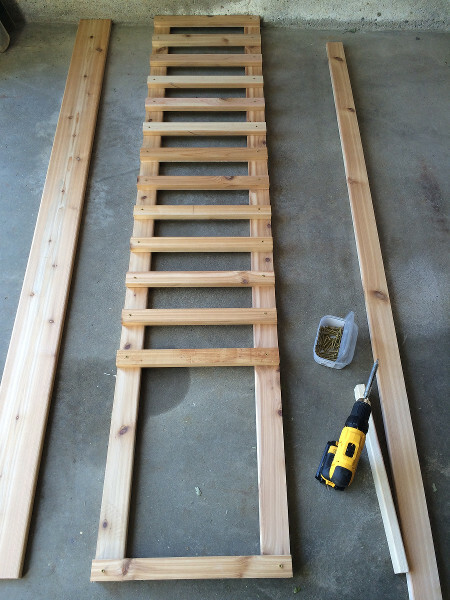 This is basically just building ladders for the climbing roses to climb. The slat at the very bottom of this picture is just temporary, it’s keeping the posts square while I work my way down. There will be 18″ left free at the base so it can go into the ground. 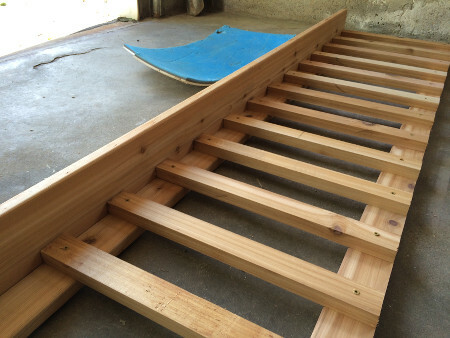 When you have finished 13 slats, the first “ladder” is done. Now screw it to the full-size plank post to start the other side. Attach the full-size plank at a right angle. The only trick was making sure it stayed perfectly square the whole time, so I kept it tight against the garage wall while working. Push it against a flat surface to keep it square. 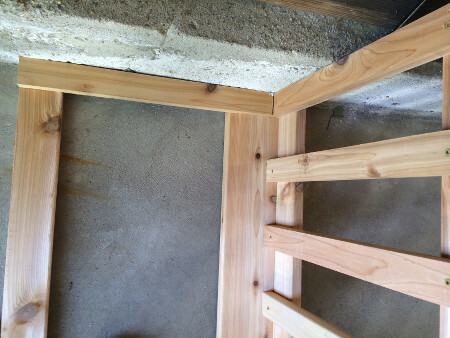 I used 2″ grip-rite deck screws, and a 2X4 scrap piece to space my slats. It doesn’t have to be perfect since the roses will eventually cover the whole thing, but it’s good to get it looking balanced. 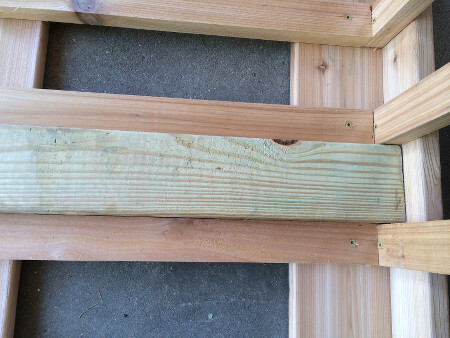 Regular 2X4 used for slat spacing. Once it’s done it’s ready to be buried, and I needed Mr. Heatherland’s help again. This is a two person job. All built and ready to be used. He used a post hole digger to get 16″ of the post bottoms into the ground while I leveled it and made sure it was plumb. Now these little climbing roses have something to climb on! I only wish I would have gotten this done months ago- better late than never. Luckily they are fast growers. 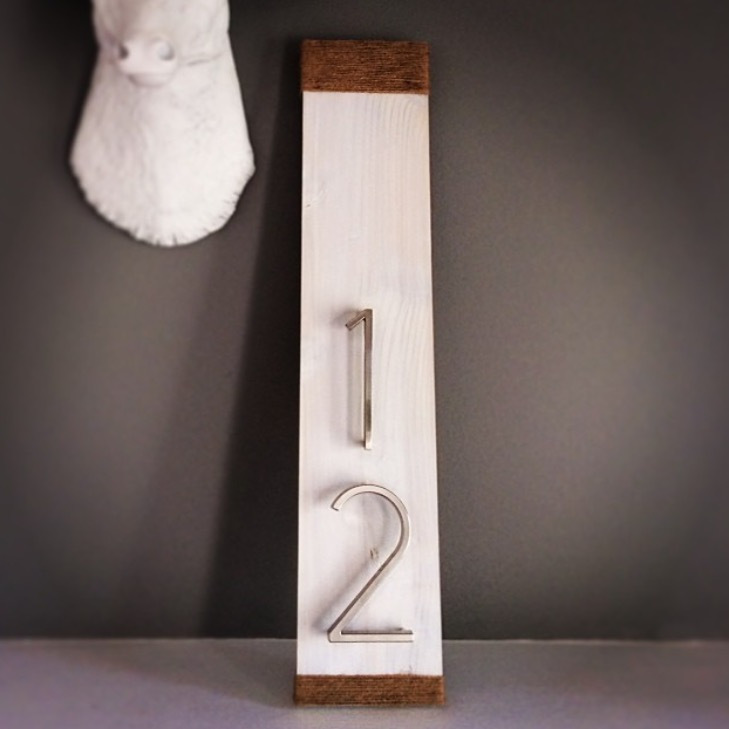 The house numbers that currently reside on our home are old, small, and kinda sad. 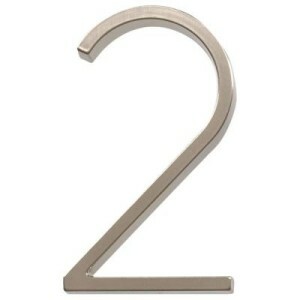 It’s time for an upgrade so I’ve been looking around the neighborhood to see what other people are using for their house numbers, and guess what? Everyone else’s are kinda sad too. My project was on a stand-still until Mr. Heatherland got home. Since I was mounting my numbers on a cedar plank I needed the lumber to be cut to size with sharp, crisp edges. I’ve been warned never to touch the table saw since all it’s factory installed safety features have been removed. This is one of the few instances I actually listen- since regardless of the safety features, I have a huge fear that someday, somehow, our table saw will attack me. He came home, obliged my request, and now I was ready to go. I started by white washing the cedar. First with a coat of my watered-down darker color for depth, using Annie Sloan Chalk Paint in Paloma. Let it dry. Do a quick sanding with 80 grit paper. Then brush on a coat bright white paint mixed equal parts with water, let it sit for a few minutes, then wipe it with a damp rag. Let it dry. Do a quick sanding with 120 grit paper. Rub on paste wax, buff, let dry. And then drill some holes for the numbers. I also decided to wrap the ends with twine (stapled on the backside) to give the whole piece more texture. Mounted the numbers into their holes with a little gorilla glue. Compress and let it rest for 2 hours. This little project set me back $20 and I’m in love with them. The outside of our house is starting to get a little personality- finally! 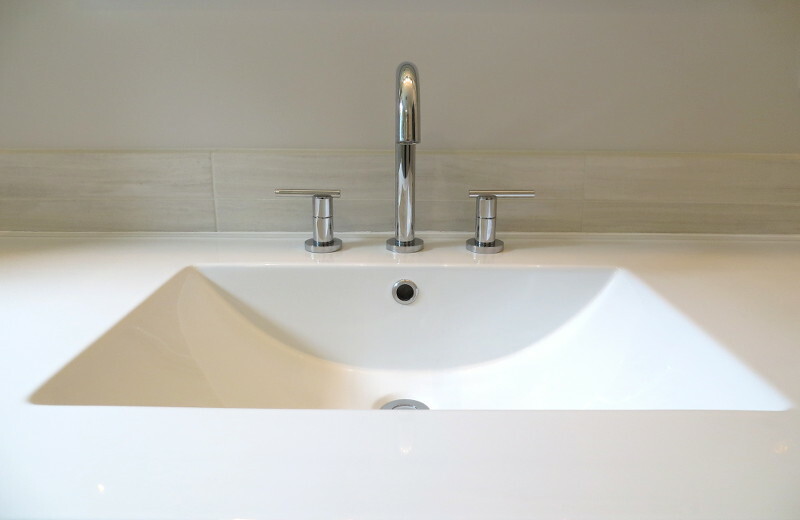 A Bathroom Vanity is a wonderful way to give your bathroom a little personality. They are an important piece of furniture and, unfortunately, often an afterthought for builders. Our bathroom is small and narrow. I was on the hunt for a vanity that I liked the look of, that would fit in our small bathroom, and most importantly fit into our budget. Our vanity needed to have legs. Why? Well, so there would be negative space underneath to let the light and reflection from the tile below shine into the room. 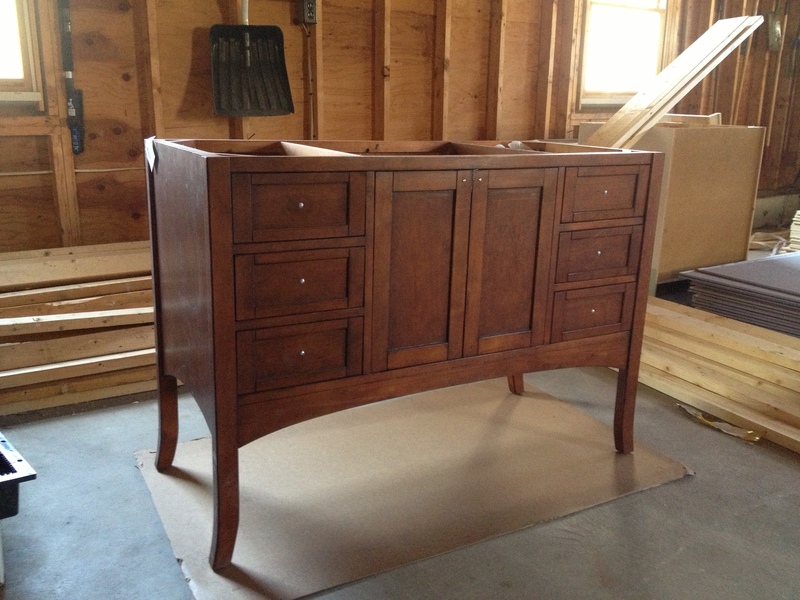 I found this one, the Cadmon Vanity, and loved the shape, but hated the color. 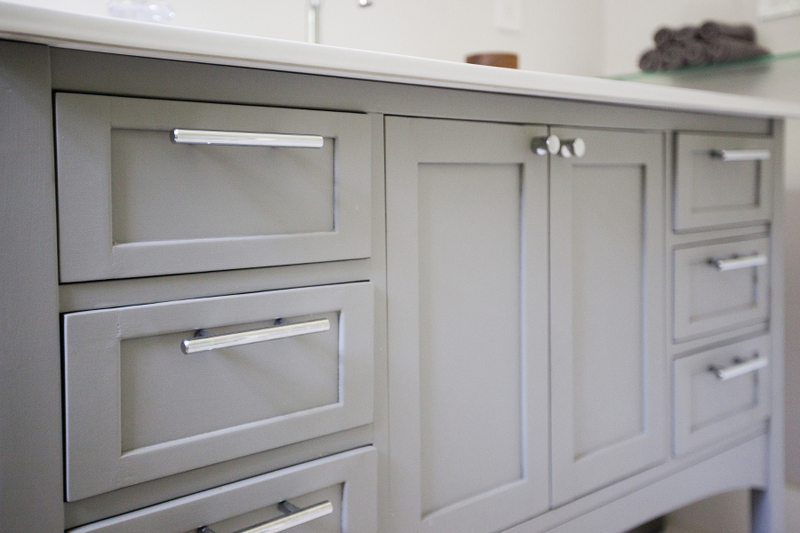 Sherwin Williams makes the most fabulous neutral shade of gray, #7669, Summit Gray. 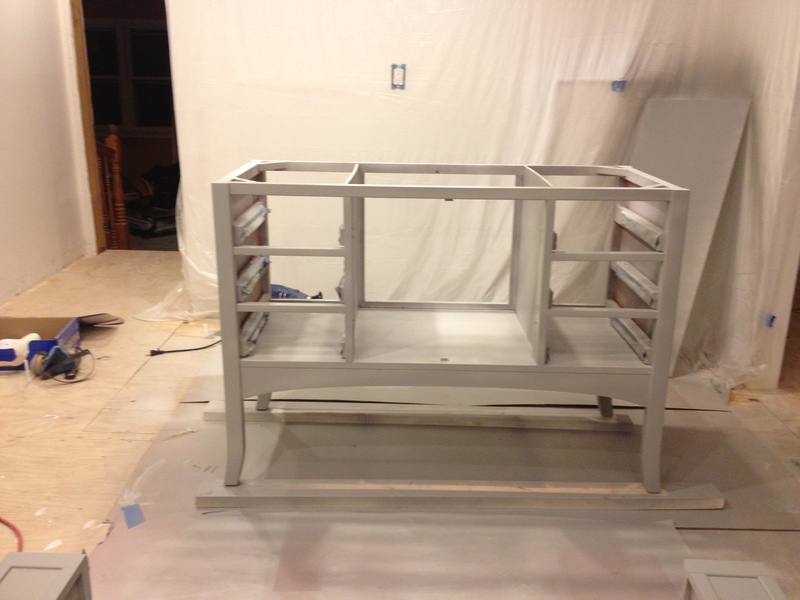 So armed with my trusty spray gun, the transformation occurred. First with a coat of Kilz (because I was too lazy to sand it), then the gray, and then a final rub down of paste wax. I did not want the vanity top to have an undermount sink. Why? Well, two separate pieces wouldn’t have conveyed the overall image. It needed to be sleek, seamless, and modern. And upon a lot of research and measuring, Avanity makes a vitreous china vanity top that would fit this base like a glove. It took a little extra effort, but it all came together perfectly, and I love that our vanity is a one-of-a-kind. Overtime I walk into the bathroom I stop to look at house beautiful our gray, contemporary vanity turned out.